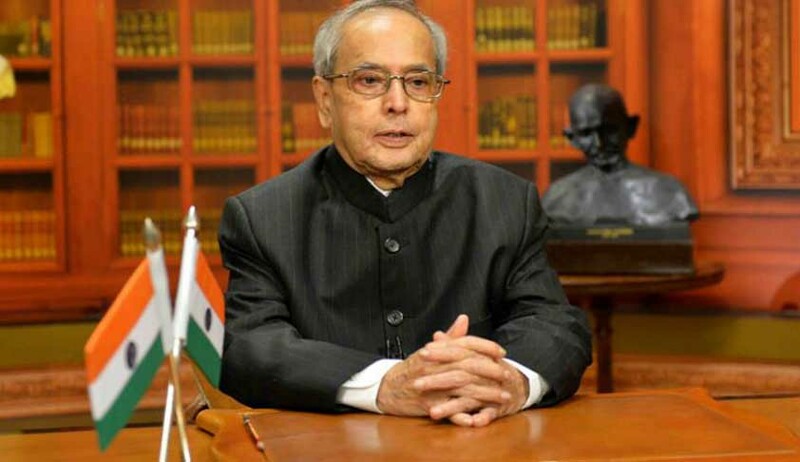 President Pranab Mukherjee, in his Republic Day address to the nation, has said time is ripe for a constructive debate on electoral reforms and a return to the practice of the early decades after Independence when elections to Lok Sabha and state assemblies were held simultaneously. He also said it was for the Election Commission to take this exercise forward in consultation with political parties. “We have a noisy democracy. Yet, we need more and not less of democracy. The strength of our democracy is evidenced by the fact that over 66 per cent of the total electorate of 834 million voted in the 2014 General Elections. The depth and breadth of our democracy sparkles in the regular elections being held in our panchayati raj institutions. And yet, our legislatures lose sessions to disruptions when they should be debating and legislating on issues of importance. Collective efforts must be made to bring the focus back to debate, discussion and decision-making,” he said. He also observed that demonetisation, while immobilising black money and fighting corruption, might have led to temporary slowdown of economic activity. “As more and more transactions become cashless, it will improve the transparency of the economy,” he said. He said India’s pluralism and her social, cultural, linguistic and religious diversity were our greatest strengths. “Our tradition has always celebrated the ‘argumentative’ Indian; not the ‘intolerant’ Indian. Multiple views, thoughts and philosophies have competed with each other peacefully for centuries in our country. A wise and discerning mind is necessary for democracy to flourish. More than the unison of ideas, a healthy democracy calls for conformity to the values of tolerance, patience and respect for others. These values must reside in the hearts and minds of every Indian; inculcating in them a temperament of understanding and responsibility,” he added. Read the full text of the President’s speech here. On the eve of the sixty-eighth Republic Day of our nation, I extend warm greetings to all of you in India and abroad. I convey my special greetings to members of our Armed Forces, Para-military Forces and Internal Security Forces. I pay my tribute to the brave soldiers and security personnel who made the supreme sacrifice of their lives in defending India’s territorial integrity and maintaining law and order. When India attained freedom on 15th August 1947, we did not have an instrument of governance of our own. We waited till 26th January, 1950 when the Indian people gave to themselves a Constitution to secure for all its citizens, justice, liberty, equality, and gender and economic equity. We promised to promote fraternity, dignity of the individual, and unity and integrity of the nation. On that day, we became the largest democracy of the world. The faith and commitment of people gave life to our Constitution and our founding fathers, wisely and carefully, steered the new nation past its troubles of being a poor economy with huge regional imbalances and a vast citizenry deprived of even basic necessities. It goes to the credit of the strong institutions of democracy built by our founders that for the last six and a half decades, Indian democracy has been an oasis of stability in the region troubled by unrest. From a population of 360 million in 1951, we are now a 1.3 billion strong nation. Even then, our per capita income has shown a ten-fold increase, poverty ratio has declined by two-thirds, average life expectancy has more than doubled, and literacy rate has shown a four-fold increase. We are today the fastest growing amongst the major economies of the world. We are the second largest reservoir of scientific and technical manpower, the third largest army, the sixth member of the nuclear club, the sixth member in the race for space, and the tenth largest industrial power. From a net food grains importing country, India is now a leading exporter of food commodities. The journey so far has been eventful, sometimes painful, but most of the times, exhilarating. What has brought us thus far will take us further ahead. But we will have to learn to adjust our sails, quickly and deftly, to the winds of change. Evolutionary and incremental growth will have to accommodate rapid disruptions brought in by advances of science and technology. Innovation, more so inclusive innovation, will have to become a way of life. Education will have to keep pace with technology. In the race between man and machine, the winner will have to be job generation. The velocity of technology adoption will call for a workforce that is willing to learn and adapt. Our education system will have to join hands with innovation to prepare our youth for life-long learning. Our economy has been performing well despite the challenging global economic conditions. In the first half of 2016-17, it grew at a rate of 7.2 percent – same as that last year – showing sustained recovery. We are firmly on the path of fiscal consolidation and our inflation level is within comfort zone. Though our exports are yet to pick up, we have managed a stable external sector with sizeable foreign exchange reserves. Demonetization, while immobilizing black money and fighting corruption, may have led to temporary slowdown of economic activity. As more and more transactions become cashless, it will improve the transparency of the economy. The highest form of freedom carries with it the greatest measure of discipline and humility. Freedom that comes from discipline and humility cannot be denied; unbridled license is a sign of vulgarity injurious alike to self and others” (unquote). Youth today are brimming with hope and aspirations. They pursue their life goals, which they perceive will bring them fame, success and happiness, with single-minded devotion. They consider happiness as their existential objective, which of course is understandable. They search for happiness in the highs and lows of day-to-day emotions, and in the fulfilment of the objectives they have set for themselves. They look for a job as well as a purpose in life. Lack of opportunities leads to frustration and unhappiness which manifests itself in anger, anxiety, stress and aberrations in behaviour. This has to be dealt with by inculcating pro-social behaviour through gainful employment, active engagement with community, parental guidance, and empathetic response from a caring society. The object of government in peace and in war is not the glory of rulers or races but the happiness of the common man” (unquote). Happiness is fundamental to the human experience of life. Happiness is equally the outcome of economic and non-economic parameters. The quest for happiness is closely tied to sustainable development, which combines human well-being, social inclusion and environmental sustainability. We must make happiness and well-being of our people as the touchstones of public policy. Start-up India and Atal Innovation Mission are fostering innovation and new-age entrepreneurship. Under the Skill India initiative, the National Skill Development Mission is working on skilling 300 million youth by 2022. It is my firm conviction that India’s pluralism and her social, cultural, linguistic and religious diversity are our greatest strength. Our tradition has always celebrated the ‘argumentative’ Indian; not the ‘intolerant’ Indian. Multiple views, thoughts and philosophies have competed with each other peacefully for centuries in our country. A wise and discerning mind is necessary for democracy to flourish. More than the unison of ideas, a healthy democracy calls for conformity to the values of tolerance, patience and respect for others. These values must reside in the hearts and minds of every Indian; inculcating in them a temperament of understanding and responsibility. panchayati raj institutions. And yet, our legislatures lose sessions to disruptions when they should be debating and legislating on issues of importance. Collective efforts must be made to bring the focus back to debate, discussion and decision-making. As our Republic enters her sixty-eighth year, we must acknowledge that our systems are not perfect. The imperfections have to be recognized and rectified. The settled complacencies have to be questioned. The edifice of trust has to be strengthened. The time is also ripe for a constructive debate on electoral reforms and a return to the practice of the early decades after independence when elections to Lok Sabha and state assemblies were held simultaneously. It is for the Election Commission to take this exercise forward in consultation with political parties. In a fiercely competitive world, we have to work harder than ever to redeem the promises that we make to our people. o We have to work harder because our war on poverty is not yet over. Our economy is yet to grow at over 10 percent for an extended period of time to make a significant dent on poverty. One-fifth of our countrymen still remain below poverty line. Gandhiji’s mission to wipe every tear from every eye still remains unfulfilled. o We have to work harder to provide food security to our people and to make the agriculture sector resilient to the vagaries of nature. We have to provide better amenities and opportunities to our people in villages to ensure a decent quality of life. o We have to work harder to provide enhanced employment opportunities to our youth through the creation of world-class manufacturing and services sectors. The competitiveness of the domestic industry has to be improved by focusing on quality, productivity and efficiency. o We have to work harder to provide safety and security to our women and children. Women must be able to lead their lives with honour and dignity. Children must be able to enjoy their childhood to the fullest. o We have to work harder to change our consumption pattern which has resulted in environmental and ecological de-gradation. We have to appease nature to prevent it from unleashing its fury in the form of floods, landslides and droughts. o We have to work harder because our pluralistic culture and tolerance are still being put to test by vested interests. Reason and moderation should be our guide in dealing with such situations. o We have to work harder to keep at bay the dark forces of terrorism. These forces have to be dealt with firmly and decisively. The forces inimical to our interests cannot be allowed to grow. o We have to work harder to ensure the well-being of our soldiers and security personnel who protect us from internal and external threats.